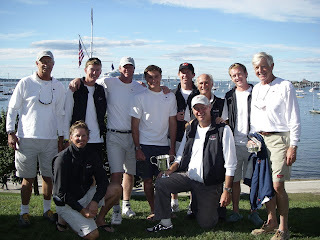 September 2007 found me joining Gary Jobson on his new Swan 42 “Mustang” for the Stamford-Vineyard Race. The first time we had ever sailed together on the same boat; having competed against each other in college and on twelve meters for the America’s Cup. 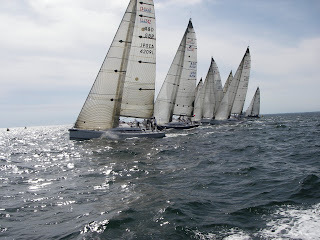 A few weeks later I was again aboard “Mustang” for the first ever Swan 42 North American Championships in Newport, hosted by the New York Yacht Club. Gary had assembled a fine crew, each bringing some strength to the group. The racing was keen and close. Gary did an outstanding job steering the boat. All the starts were great. We ended the series in second place. Posted on August 25, 2008 Categories gary jobson, stamford vineyard race, stamford yacht club, swan 42Leave a comment on Swan 42 "Mustang"
This race, in stark contrast to the Bermuda race earlier in the year, has become a legend of sorts. 35 knots at the start; 53 boats entered, three boats finished in a race that saw the wind build to 60 plus knots. The wind direction was very steady out of the East, Making the course a windward-leeward race. We hit 26 knots with a storm jib and two reefs. We finished second to Blue Yankee, our confidence in the boat having received an enormous boost after this thrashing. 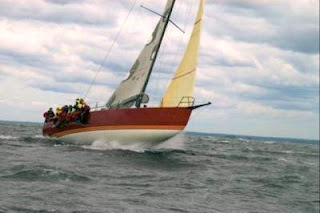 the photo shows the crew stacked aft behind Jack Cummiskey, as we surf downwind.